Live from the Royal Albert Hall in London, tenor James Gilchrist joins the Zurich Chamber Orchestra under Roger Norrington in a performance of Part 1 of Bach's St John Passion. Few classical works have the urgency and dramatic immediacy of Bach's St John Passion. Here it is vividly realised by a cast led by tenor James Gilchrist. The finest Evangelist of his generation, Gilchrist sings the role at the Proms for the first time, under conductor Sir Roger Norrington, 80 this year. In the first of two Proms appearances, leading Bach interpreter Sir Roger Norrington - celebrating his 80th birthday this year - directs his Zurich Chamber Orchestra in the St John Passion (bookended later this season by Peter Sellars's staging of the St Matthew Passion, conducted by Sir Simon Rattle) - a work noted for its dramatic sweep and emotional immediacy in the recounting of events leading to the crucifixion of Christ. It is realised here by a cast led by tenor James Gilchrist, a distinguished Evangelist of his generation. Performer: Zürcher Sing-Akademie, Zurich Chamber Orchestra. 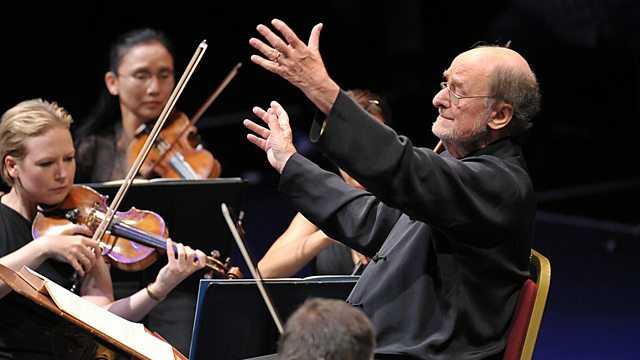 Conductor: Sir Roger Norrington.